The Emergency Services of the Boulder County Sheriff’s Office also provides Seasonal Information, from Christmas lighting to tubing bans. 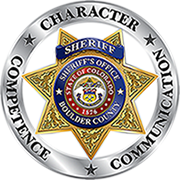 The Boulder County Sheriff’s Office does not charge for search and rescue services in Boulder County. The following Boulder County Sheriff search and rescue resources listed below also do not charge for services. Always let someone know where you are going, place or trail head you plan to start at and where plan to return. General time frames of your outing. Always take extra water, food and clothing. Weather in Colorado is very unpredictable and can change from blue sunny skies to cold rain or snow in a matter of minutes even in the summer months. If you have a cell phone always make sure the battery is fully charged. What is the CORSAR card: The CORSAR card replaces what was known as the Colorado Hiking Certificate. Money generated from the sale of these cards (and formally from the hiking certificate) goes to the Colorado Search and Rescue Fund, which then provides reimbursement for expenses incurred during search and rescue missions.